How do you feel about making Code A Round 2? I was confident since it was a PvZ. It’s just that I’ve lost a bit of steam lately so I was a little bit worried too. Luckily, I have made it and am very happy. It was a game where I was very ahead but as I gave away my sentries, I had a crisis. I think I dropped the match due to impatience. If you were to evaluate your own games today? I feel like I didn’t make any major mistakes in Sets 2 and 3 but the coach says that my play wasn’t impressive. I’ll have to decide after watching the VODs. 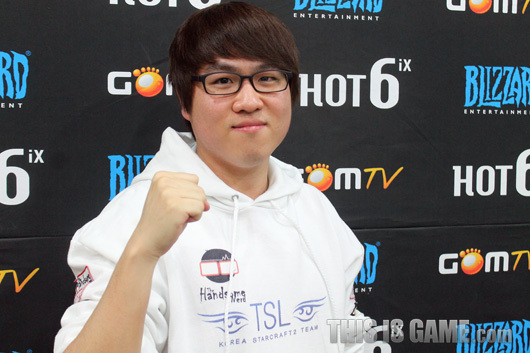 Startale took second place at GSTL due to regrettable circumstances, did it not affect your games today? I think it affected my teammates more than myself. The game that had to replayed was basically won for Parting. I regret it so much but it can’t be helped so we’ll make sure to win next season. You’ve never gotten into Code S, what do you think is the reason? I’m not the type to practise for an extended period of time so I don’t improve easily. Even this year, I started off working hard but for a month or two after that, I fooled around (laugh). This season, I will work hard enough to make Code S for certain. If I reinforce my PvZ, I should be able to get into Code S.
Your determination going into Code A Round 2? I understand that it’s either TSLRevival or MVPDongRaeGu. Regardless of who advances, I will prepare my PvZ so that I can give a good showing. 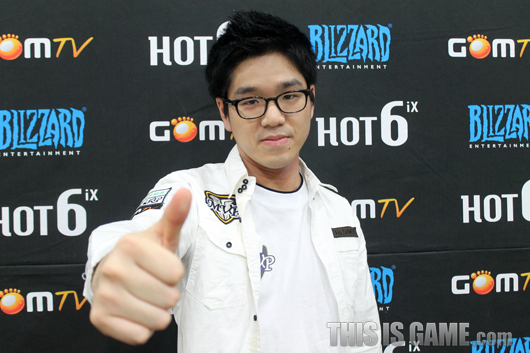 If possible, I would like to take on DRG in Round 2. It will feel more worthwhile if I defeat a strong player. I want to thank the Zergs on my team and also FXOSirius and NSHSSeal who helped with practice. I want to say thanks to my family and girlfriend who always cheer me on. Your thoughts on getting into CodeA Round 2? I’ve been on a roll lately so I was confident. Also, I’d prepared my TvZ well so I knew I would advance. You overpowered the Zerg using a mech build. Since I’d never shown a mech build before I knew that it would work for certain this time. Its win rate was good during practice so I could play with confidence. Since joining Complexity, you’ve been showing good results. I think there’s been a lift in mood after changing teams. It’s a foreign team but they’re so nice to me so I am playing comfortably. You took third place at MLG. Playing in front of so many fans made me want to play on such a stage once more. I just regret facing off against DRG twice and losing both times. Are you confident about making Code S? I will practise with the goal of making Code S. If I play as well as I do in practice, there’s a 90% chance I will make it. I want to thank my girlfriend and parents who came with me today and players who helped with practice. Your thoughts on making Code A Round 2? The games took too much effort. I got nervous after dropping Set 1 so I am relieved that I made it through. It was hard to prepare since there was no info on the player. I had to prepare for all kinds of strategies so it was annoying. You countered your opponent’s strategy excellently and as a result won. My worker scout was late so I just looked at his natural with my overlord and saw that there was no expansion. So I expected a proxy strategy. You were eliminated immediately last season of Code S.
Actually, I had a temperature of 45℃ (laugh). I’m joking but my condition really was quite bad on the day. If I were in top form, I would’ve played better. Did Prime’s GSTL victory affect today’s games? I reflected a lot after losing my game in GSTL. I was so depressed I couldn’t sleep. My team won but I wasn’t able to contribute at all so I was really sad. I was angry at myself for not being able to react correctly despite figuring out my opponent’s play. How was playing in the US? The food was bad. It wasn’t the Pizzas and Hamburgers that I expected. I couldn’t overcome jet lag so I played tired as well. Still, playing in front of so many people was great. I think it’s been a great help to me as gamer. I want to thank my sponsors, Kim, Hong Jae (ClassicPrime) who helped me with practice, and Kim, Sang Goo ‘Hyung’ who always comes to cheer me on with tasty snacks. I will prepare hard for Round 2 and win for sure. You are advancing to Round 2 after taking down SC. Tell us how you feel. I feel great. I wasn’t thinking that I would advance so going up a level like this makes me glad. You took the match after some close games, how do you feel about that? I thought that I would take the first set no matter what so I was dismayed. I think SC prepared a lot for the first set. I made too many mistakes in the engagements in the centre so I couldn’t win in terms of strength. In Set 2, your opponent did an all-in. My build for today was to make a lot of zerglings instead of drones. So I was able to hold the rush easily. You seem to be doing well recently. I haven’t been trying anything new or increased my practice. I think my consistent effort is finally paying off. This is the result of working hard. I am confident. He is a good player but I will win. If I play with the confidence that I can win, I should be able to do well. How is your team lately? We’re in maintenance mode after GSTL. We’ve moved training houses and recruited new players so we’ve succeeded in renewing the atmosphere in the team. I want to thank TSLPunisher and TSLCenter who helped with practice. I will make sure to take them out for a meal when I get back. Hyun and Polt are attending Dreamhack the day after tomorrow so I hope they do well. You now move onto Round 2. Back in Code S, I thought I wouldn’t feel like playing in Code A but once I’m here, the Code A games feel precious to me too. As Code B loomed ever so close, desperation came flooding in. Why do you think you dropped from Code S? My condition wasn’t great on the day and I was lacking in practice due to foreign tournaments. As a ersult, I think I fell behind the metagame. However, with recent practice, I’m in top form so there is no need to worry. Then, shouldn’t you attend fewer foreign tournaments? I plan to keep attending foreign tournaments. If I take care of myself and concentrate on practice after foreign tournaments, there should be no problem..
I’m also happy that it’s him. 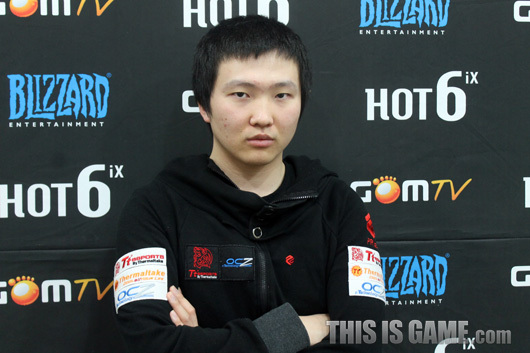 I prefer ZvP to ZvZ and I’ve wanted to face Ace sometime. It’s worked out well. Doesn’t Genius make fun of you at the training house? I want to thank my coach, friends, parents, brother and girlfriend. Recently, fans have been worrying about my state but it’s okay to stop worrying since it’s much better. I will quickly get back into Code S and show you. Your thoughts on advancing to Round 2? I think I had it easy because it was a Zerg. I take on Jjakji in Round 2 and I’ll be happy if I win. Due to misplacement of my simcity in my third expansion, I let units in and after that, I knew the game would be difficult. I thought about the possibility of losing to mutalisks before my mothership finished. When did you decide you had won? When my mothership was taken by neural parasite, I looked at the opponent’s army composition and realised there wasn’t much there. So I decided that I would be able to turn the game around if I engaged. I am very satisfied. In last season’s round 2, I had to face a Protoss which as a bit of a shame and as if GomTV realised this, they set me up with a great bracket. I want to take this opportunity to change my PvT image. Your PvT win rate is very low, are you confident you can overcome this? I won’t be able to completely get rid of the impression that I am weak at PvT but by getting through Round 2, I want to show that it is possible for me to win against Terrans. I am so happy to be back in Korea. I’m used to the food and I can get around without any worries. In America, I wasn’t used to the time difference or the training house so I had a hard time. I expected as much joining a foreign team but I stayed there for far too long this time. 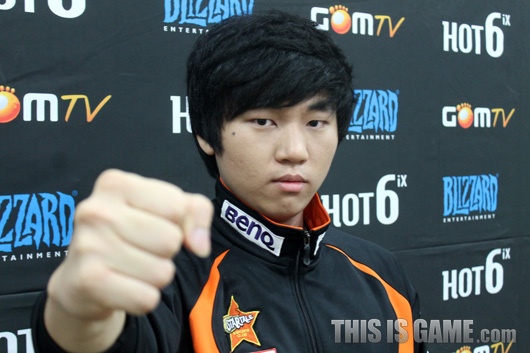 You fell from Code S in ro32 last season, what was the reason? At the time, I practised hard for my match against SC thinking I would get rid of the bad PvT image but I lost so helplessly that I was out of it for the next match. 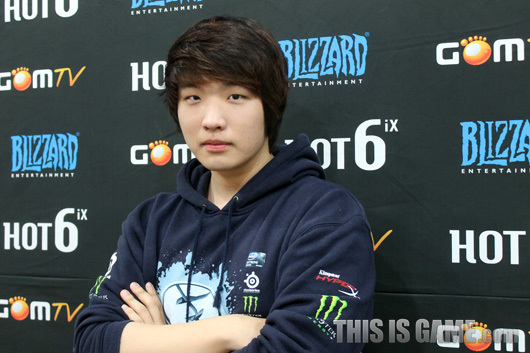 Are you confident in making it back into Code S? As long as I beat Jjakji, I can 100%. Yesterday was IM’s Kang, Don Hoon coach and SlayerSRyung’s birthday. It’s late but happy birthday. I’ve been having a hard time lately so I want to say thanks to all who supported me. Your thoughts on getting into Round 2? I am happy to have won. It was refreshing to play in Code A in such a long time. I will take this opportunity to grow as a player. Your thoughts on playing against SlayerSScocer? Since I’m on a roll lately, I thought he would all-in me but he opted for macro builds which surprised me. Then, I realised that Soccer was very nervous in Set 1. I think that’s why I won easily. This was my fifth time in a foreign tournament. I wasn’t sure about winning before the tournament began but once I saw the stage, I wanted to win. It felt like I would have to win to grow as a player. Did anything change after your win? Nothing major. People around me congratulated me a lot and gave me advice that I shouldn’t be too arrogant and keep the progressing. My parented were unexpectedly unemotional but once I told them that I won forty thousand dollars, their tone of voice changed (laugh). 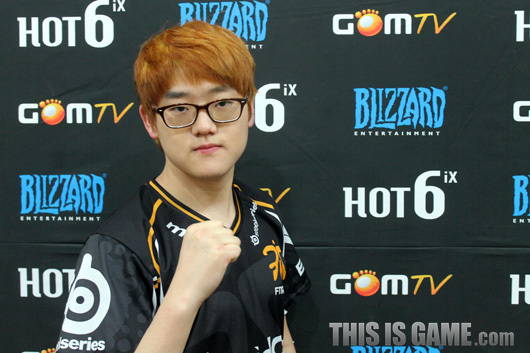 Do you regret your fall from Code S? As I played just after attending a foreign tournament, I wasn’t able to concentrate well. To be honest, I should have practised while preparing for MLG but I didn’t get around to it. I am reflecting on my inability to prepare well and falling as a result, and this season, I won’t as lazy and work hard. I am one of the public servants (T/N: literal translation of the word he used. He means that he’s consistently been in Code S) of Code S so I will work hard to keep my place. Who do you want to play against in Round 2? 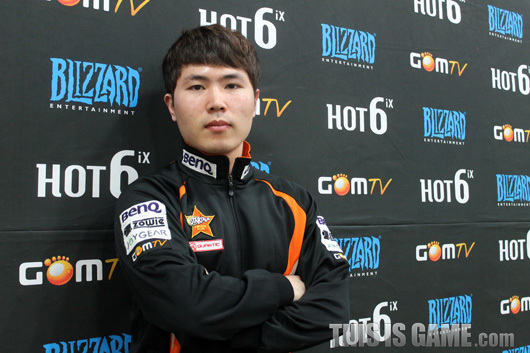 I hope Huk makes it. I lost to him once before in Code S. I want to take my revenge. I want to thank my sponsors Eizo, MSI, Raidcall and Steel Series. Also I want to thank my manager Patrick and Elroy(T/N: ?) who accompanied me today and also those who helped me with practice. Your thoughts on taking down Chris Loranger and moving onto Round 2? 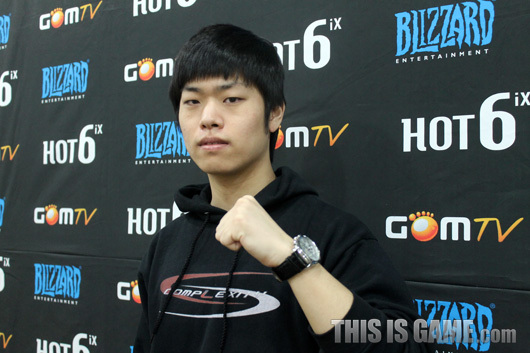 This is my first win in the GSL. I always dropped out in the first round before which was a shame so I am happy to have made it through. What did you think about your bracket? I’ve always faced opponents I wanted to avoid in the past and the same thing happened this time. So I was worried by the thought that I may fall out of the GSL again. I think it went well like I planned. It went according to my preparation. Startale is on a roll this season. The reason is a secret (laugh). We won’t be satisfied only with this and work harder so that we can continue our momentum. You take on aLive in Round 2. I think it will be a very difficult match. He’s a player who has taken down MMA twice lately and as such, I should be wary. I expect a difficult match but will still prepare hard and play great games. It’s straight to Code S. I should be able achieve this as long as I take down aLive. If I take down aLive who’s on such a roll lately, shouldn’t I catch some momentum? If you are unlucky, you may meet July in Round 3. July is busy with Code S practice so I haven’t been able to talk to him much. He’s working hard so he will make it further. Since changing teams, I have received a lot of help from those around me. I’ve improved through practice and advice. Moving teams was a great opportunity for me. I want to thank Tiger, Squirtle and Parting who helped with practice. Even if I fall in Round 2, there is still Up and Downs so I will definitely give you even better games. Lastly, I want to thank Red Bull and Zowie Gear for sponsoring our team. Wow, you're going to translate all 8 interviews? Amazing effort. Really appreciate what you're doing. Don't ever stop. StarTale boys doing soo good! umm, i have an assignment due soon so I may have to put off the rest until tomorrow , rest assured they're coming along though. I think Kim Hong Jae is classic prime. I want to thank my sponsors, Kim, Hong Jae who helped me with practice, and Kim, Sang Goo ‘Hyung’ who always comes to cheer me on with tasty snacks. I will prepare hard for Round 2 and win for sure. Symbol Interview now up. The other four interviews may come a few hours later or tomorrow depending on how sick I get of the assignment I'm currently doing. Wow you are so awesome! Or it was just too greasy for him. My build for today was to make a lot of zerglings instead of drones. loled at Ace interview. "i never made into code S cause i don't like to train much."